What does it take to become an effective leader? Is leadership a natural talent or an acquired skill? Is management the same as leadership? What are the differences between tactical and strategically planned leadership styles? Answers to the above questions require experienced training. 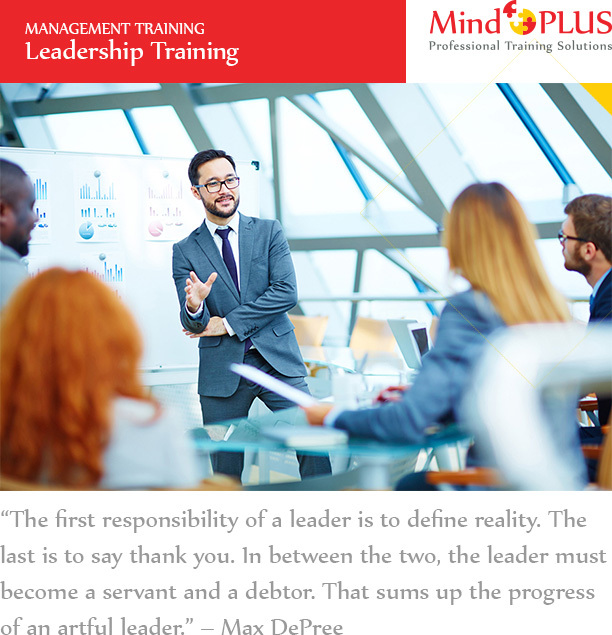 This course offers effective skills and practical solutions for successful leadership. Detailed course materials, exercises and a comprehensive action plan at the end of the course will maximise your learning and will allow you to take full advantage of these newly acquired skills once back at work. Effective leaders have skills and behaviours that set them apart from others. Successful leaders inspire and motivate people because they have the ability to create a vision and transfer it to those around them. They encourage hope, positivity, ambition, compassion, and they are good communicators; they know about planning and more importantly they can manage people. While all good managers are not leaders, all successful leaders know how to manage people. Good leaders have strong values, defined goals and clear plans to achieve those goals but are able to remain pragmatic and embrace change. Their flexible approach allows them to change their strategy and even beliefs to deal with different situation and unexpected developments especially in times of crisis. They are good problem solvers and encourage creativity, confidence and determination in their staff to overcome setbacks and problems. Although skills are an important part of making a strong leader, it is the behaviour that often marks a successful leader. Great leaders show integrity, enthusiasm, determination, confidence and wisdom. They understand people’s needs and group characteristics. They appreciate hard work and reward it accordingly. Effective leadership without defined goals and objectives is impossible. As a successful leader you have to make it clear to your staff what are the common goals of your organisation. You need a strategy to achieve your goals. A clear and comprehensive strategy will prevent the team getting carried away with unimportant details and help them focus on the main objective. Strong leaders are at the centre of organisations. They are capable of interacting with a full circle of people, from staff to stakeholders. This interaction allows you to identify needs and recognise opportunities. Successful leaders understand the art of influence. They know who to influence and how. Learning about different influence techniques to use on a variety of people will not only increase your authority but also increase the chance of success. Motivation increases enthusiasm, positive energy and productivity. By understanding your team’s vision you learn to motivate them effectively. Using the right questioning techniques will also help you encourage efficient problem solving. As a strong leader you need to understand your people’s perspective, their abilities and vision in order to bring the best out of them. Don’t forget that as a successful leader you are a role model and should live up to it. Some leaders have one leadership style which works in some situations but not in others. Effective leaders however understand the value of pragmatism and develop different styles of leadership suitable for changing environments. You will learn about different styles of leadership and what style to use in different situations and with different people. Effective delegation not only gives a leader more time to deal with more important issues, it also increases team’s confidence in their abilities. Learn the rules of effective delegation. You will learn how to brainstorm, inspire your team to become more creative, encourage contribution and how to capture ideas and information. As a leader you need to identify risks promptly in order to deal with them effectively and to prevent any future problems. Recognising opportunities on time will allow you to take advantage of situations successfully. At the end of this course you will create an action plan which will improve your leadership skills. Audience: Anyone who needs to be in a leading role will benefit from the skills provided on this course.